Afternoon tea has become a bit of a cliche. 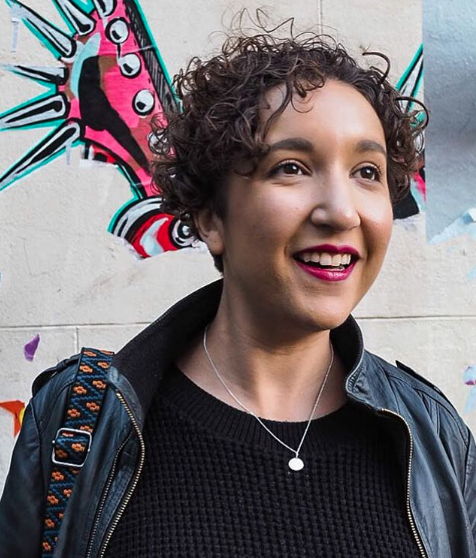 How I feel about them is exactly the same as my previous mumblings on roast dinners: everyone thinks they can do one, and charge a fortune for it too. 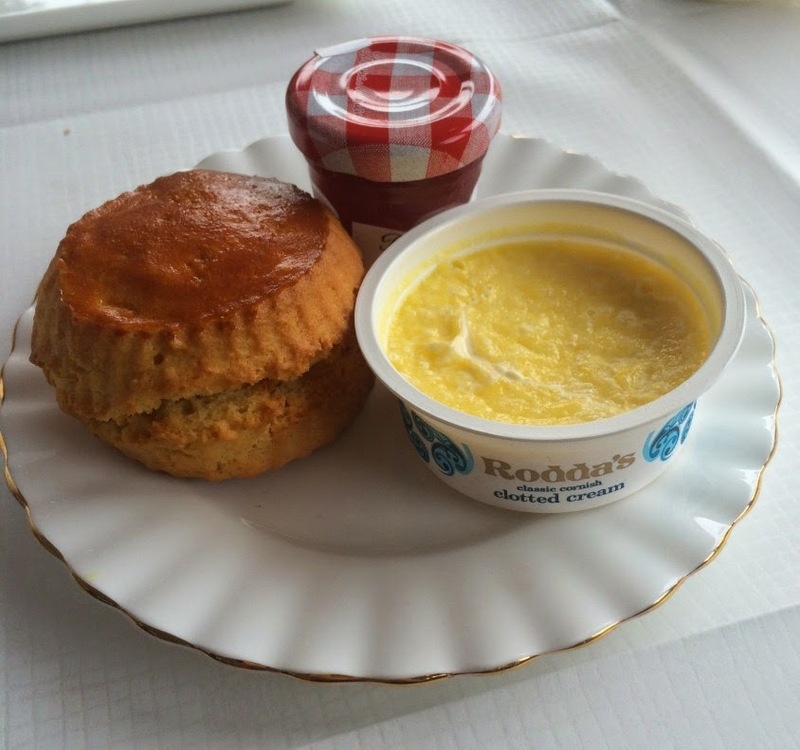 I’m a fiend for a scone and clotted cream; if I hit Cornwall in the Summer, Rodda’s basically have to put on an emergency alert. 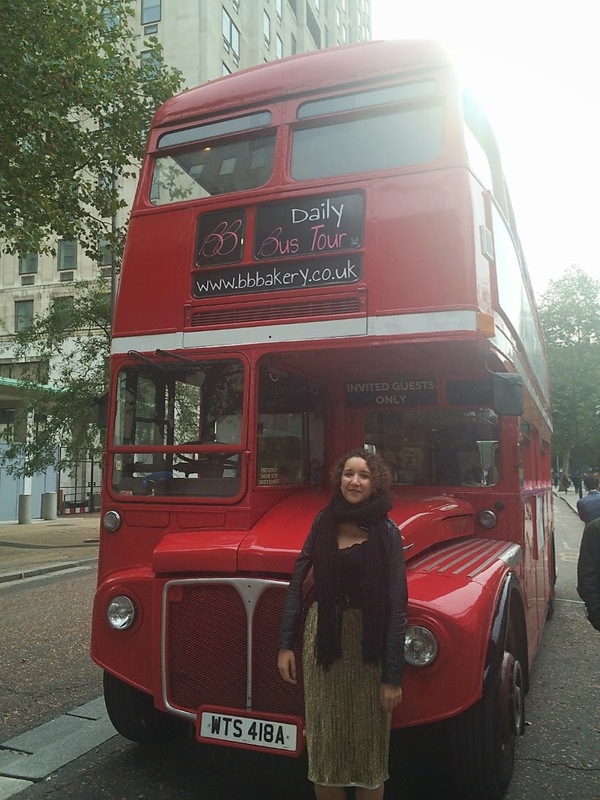 I love the classics, but I do appreciate a twist on the norm (my favourite so far being the Marmite afternoon tea I went to in 2012), so when a wonderful friend of mine invited me to go on the BB Bakery Afternoon Tea Tour Bus with her, I practically leapt down the phone and hugged to within an inch of her life. 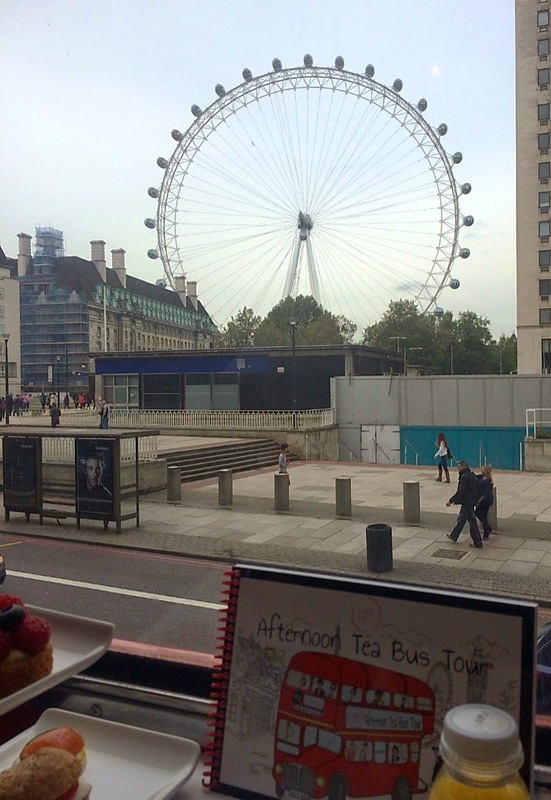 The bus picked us up in front of the London Eye and we took our place in the best seat in the house: at the front, at the top. There was a huge variety of the people on board including guys, families and a massive hen do, but everyone was in great spirits and the conductor did his best to get us all excited. On each table is a map of where the bus would be taking us, but no voiceover to tell us information as we drove past as you would get on a regular bus tour. It was a bit of a shame, especially as our route was diverted due to a sporting event. Instead of just driving us down random streets it would have been nice to have had somebody tell us a bit of history or some fun facts to get us peeking out of the windows a bit more. We could have been on any old Routemaster through London in that respect. However, the food was the obvious stand-out point. The logistics of serving food and hot drinks on a bus are plenty, and we were very amused by our tiered plates being nailed to table, and our drinks sitting in little cubby holes. 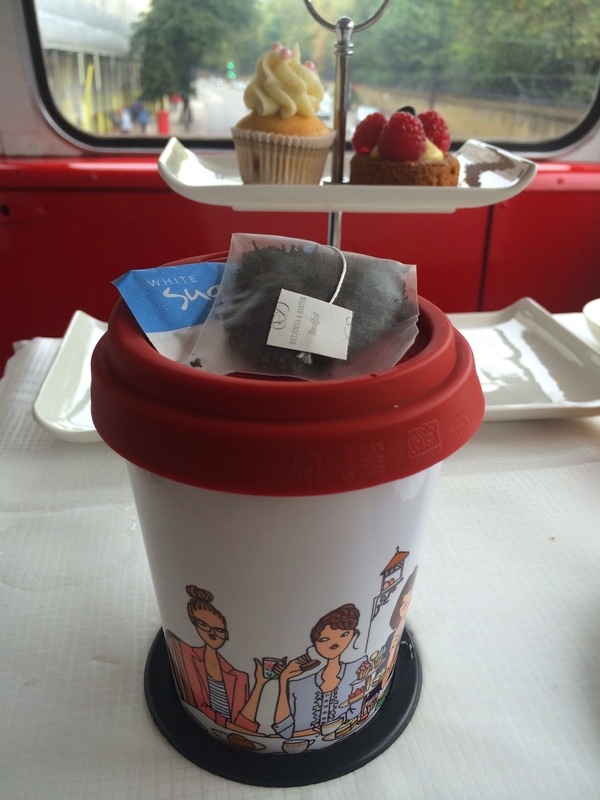 Tea was presented in a thermos so it wouldn’t splash everywhere, but that didn’t make it any less difficult to drink it without burning the roof of your mouth when the bus suddenly stops! The selection of cakes and sandwiches were cute and varied, if a little on the small side. 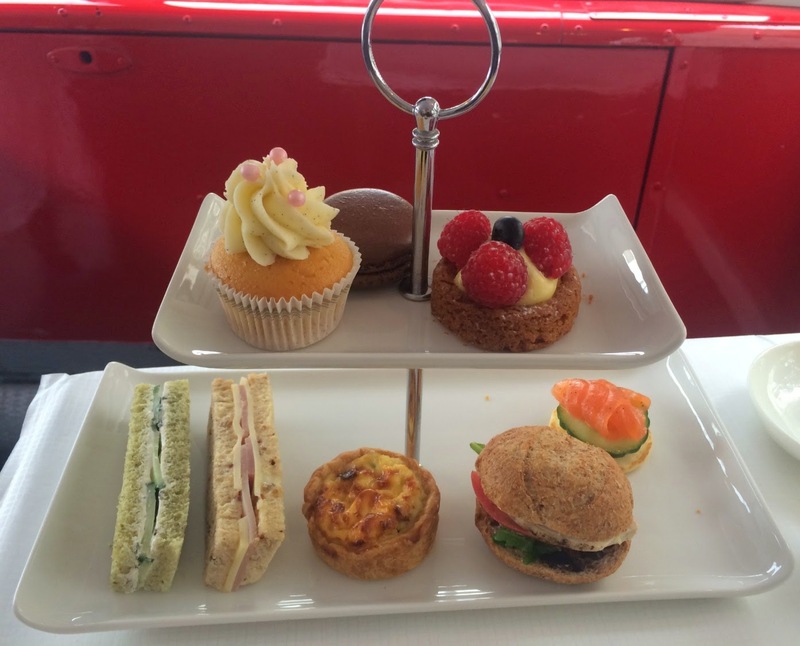 Afternoon teas are known for indulgence, but as we were on a time limit with the bus tour we had to make sure we polished off what we could and there weren’t any top-ups. I loved the smoked salmon blini and the chocolate macaron – both a good indicator of why you might want to pay a visit to BB Bakery in its static shop in Covent Garden. 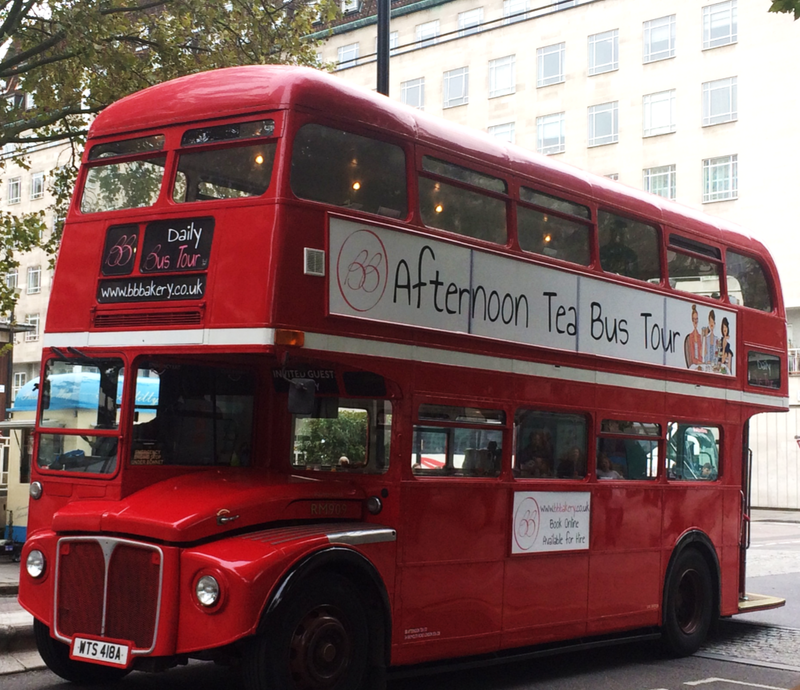 The concept of a travelling afternoon tea tour bus is, frankly, genius. I have no doubt that it will continue to be very successful, if purely down to people like me who love a bit of a gimmick. It was a friendly, fun and delicious way to spend a couple of hours, and I do love to play tourist in my own home town.